Greenpoint is largely middle class and multi-generational; it is not uncommon to find three generations of family members living in this community. The neighborhood is sometimes referred to as “Little Poland” due to its large population of working-class Polish immigrants, reportedly the second largest concentration in the United States after Chicago. 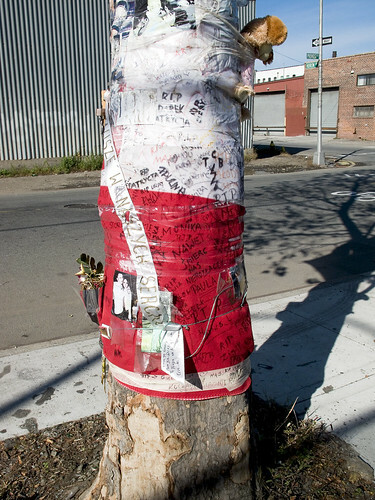 Greenpoint is not only populated with Polish immigrants and Polish-Americans, a significant population of Hispanics can be found north of Greenpoint Avenue. Italian Americans and Irish Americans can be found in the southeastern section of Greenpoint. 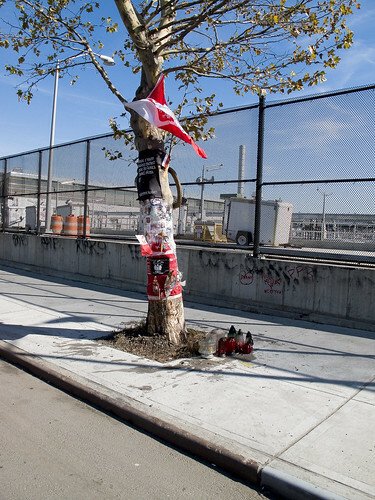 Walking the blasted earth of storied Greenpoint- after visiting the Temple of Cloacina– Our Lady of the Pentacle and myself decided to visit the Newtown Creek Nature Walk, and on our way encountered this roadside shrine on Provost Street. 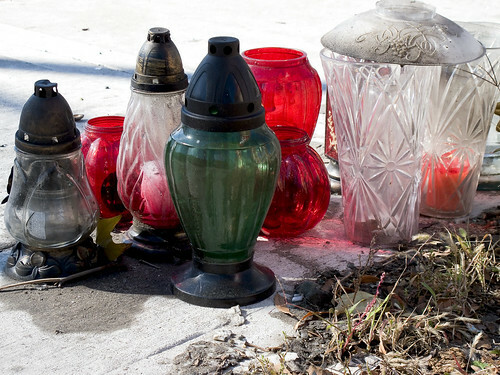 European custom often places such tributes at the scene of a fatal accident or tragedy along roadsides. Greece, in my own observation, is noteworthy for the quality and design of such shrines. In Crete, a freestanding steel structure whose paramount is a miniature of an Orthodox Church complete with glass doors and votive candles is commonly on sale in hardware stores and garden centers. Such shrines line the mountain roads, clustering around sharp turns and narrow lanes. I am ignorant of the slavic tongues, but research for this post has been revelatory. Could this have been the car involved in the crash? Location wise, this would be the spot- Provost between Huron and Green. Sadly, this memorial honors a pretty young guy. Newtown Pentacle, on behalf of our readers, offers our sympathies to the family and friends of the occupants of the car. Recall Daniel Skiba died tragically in a car accident on Saturday. Returning together with club colleague from Europe crashed its annual black Acura TL Type S sports car even owinęło around the tree at the intersection of Huron St.. and Provost St. He had no chance of survival, she was taken to hospital. The tradition of memorial devotions seen here, undoubtedly created by loving friends and intimate relations, goes back a very long way in Polish culture. Just as a footnote, I’ll mention that I consider the history of the Poles as another of the important “forgotten tales” in the history of the world alongside the Ottomans, Toltecs, and Khmer. I did a post about Pulaski (both bridge and szlachta) a while back, which is a good jumping off point for the Polish story. Should you ever travel the roads of Poland, it won’t be long before you notice either a religious figure, cross, statue, or a building that resembles a little house or miniature chapel along the roadside. These small religious chapels or shrines are commonly called roadside or wayside shrines. In Polish, they are called kapliczki. These shrines were often built at the expense of individuals, families and sometimes entire villages to publicly thank a saint or God for a benefit or blessing received. In the case of smaller shrines they acted as a remembrance for a tragedy or crime. Recently constructed shrines are usually on a much smaller scale and most often mark the spot where a fatal traffic accident occurred. Polish ethnographers claim that kapliczki, or roadside shrines, have their origins in ancient pagan traditions and Christian religious beliefs. In the times of our ancient pagan ancestors, the outer boundaries of a village or the place where two roads met, was considered to be an evil place where unfriendly spirits waited to pounce upon the unsuspecting traveler. By the same token, certain trees were seen as having magical powers. Water also had magical properties. Pagan shrines were placed at the feet of such sites and various cult activities occurred here. With the acceptance of Christianity, old beliefs and rites were hard to abandon. Our ancestors sought to protect their old beliefs yet incorporate the new faith. As a result, many kapliczki are found near trees that were believed to have magical powers such as linden, birch or sycamore trees. The mighty oak had similar properties as did evergreens. The linden, for instance, was considered especially sacred as protection against lightening and evil spirits. Later, within the Christian realm, the linden tree was dedicated to the Blessed Virgin Mary. Sycamore leaves had the power to remove spells, but were also utilized on St. John’s Eve as window and door decorations to prevent entry by witches.